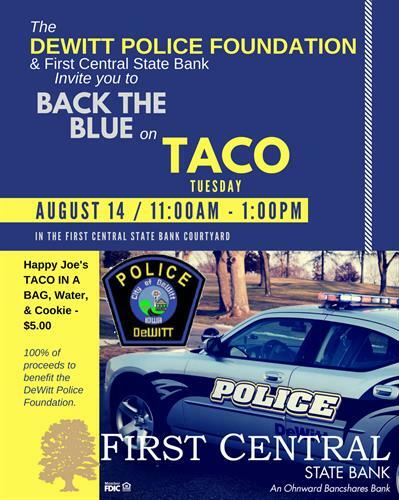 The Dewitt Iowa Police Department and First Central State Bank invite you to "Back the Blue"! We will be serving Happy Joe's Taco in a Bag, along with a water and a cookie for $5.00. Area DeWitt businesses that wish to order meals for pick-up, please contact First Central State Bank prior to August 12th at 563-659-3141. This trailer strengthens one's detective skills as a parent. This trailer provides parents with clues from a teen’s bedroom to help them determine whether their child might be experimenting with or using drugs or alcohol. Room décor, hidden compartments, and items to conceal use are located throughout the room. 100% of the funds raised will benefit the DeWitt Police Foundation. This non-profit foundation was established to promote crime prevention, public safety, and education in the DeWitt area.